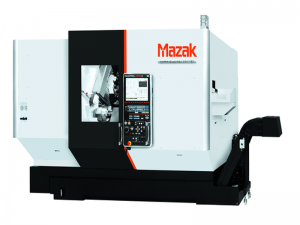 The Super Quadrex 4 axis Series of single spindle, two-turret CNC Turning Centers offers Multi-tasking machining. 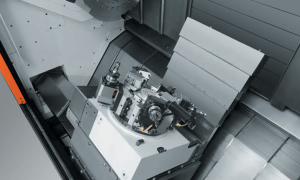 Faster cycle times by simultaneously cutting with upper and lower turrets –such as O.D. and I.D, O.D. and drilling for balanced cutting. These high production machines also increase throughput for mass production applications of longer shaft work, or for chucked work. Super Quadrex (M) configuration machines also offer live spindles for secondary drilling and milling operations on the centerline. 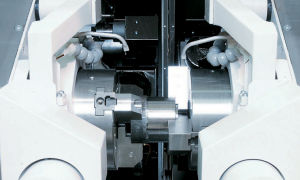 The lower turret makes it possible to have two tools cutting simultaneously for higher productivity. 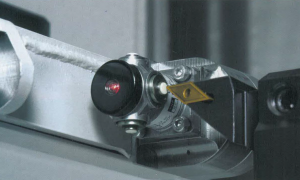 The same tool mounted on the lower turret can be used for machining on both the main and second spindles, thanks to the unique turret design that reduces the required number of tools. In addition, tools used by the INTEGREX Ⅳ series can be used by the INTEGREX i series. Allows for full 5-axis machining and DONE IN ONE® operations. Carries nine tools and performs balanced cutting.